Traditional Chinese Knots (Chinese: 中国结) is a decorative handicraft arts that began as a form of Chinese folk art in the Tang and Song Dynasty (960-1279 AD) in China. It was later popularized in the Ming and Qing Dynasty (1368-1911 AD). 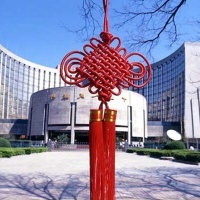 The art is also referred to as Chinese traditional decorative knots. In other cultures, it is known as "Decorative knots". Knot, in Chinese 'Jie' means vigor, harmony, and unification, Therefore, this unique Chinese knots artwork has been a popular gift for thousands of years and embodies best wishes. People wore it in the beginning as a decorative addition to clothing (usually with the jade wearing), and later, used it to decorate their houses. Though the weaving techniques are complicated, ropes, in hands of a deft craftsman appear effortless moving the shuttle in between the rows of ropes. A Chinese knot is usually symmetrical in structure and colorful with jade or porvelain beads. This no doubt adds more jubilation to any festive atmosphere. The characteristic of Chinese knot is that it is purely hand-made, made of a single rope and named by its specific form and meaning. By combining different knots or other auspicious adorments skillfully, a unique auspicious ornament which represents beauty, wisdom and wishes is formed. For example, "Full of joy", "Happiness & Longevity", "Double Happiness", "Luck and Auspiciousness as one wishes" are Chinese traditional pleasant phrases expressing warmest regards, best wishes and finest ideal. In Chinese language, "knot" has the meanings of reunion, friendliness, warm, marriage, love etc. In addition, "knot" and luck, felicity" have the same meaning, so Chinese knots are often used to express some good wishes including happiness, prosperity, love and no evils. To fit in with the needs of morden life, Chinese knot has various products. The two main series are auspicious hanging and knitting clothing adorment. Auspicious hanging include large taperstry, big room hanging, automobile hanging etc. Knitting clothing adornment includes ring, eardrop, hand chain, necklace and other woman's special adorments. Archaeological studies indicate that the art of tying knots dates back to prehistoric times. Recent discoveries include 100,000-year old bone needles used for sewing and bodkins, which were used to untie knots. However, due to the delicate nature of the medium, few examples of prehistoric Chinese knotting exist today. Some of the earliest evidence of knotting have been preserved on bronze vessels of the Warring States period (481–221 BCE), Buddhist carvings of the Northern Dynasties period (317–581) and on silk paintings during the Western Han period (206 BCE–CE6). The phenomenon of knot tying continued to steadily evolve over the course of thousands of years with the development of more sophisticated techniques and increasingly intricate woven patterns. 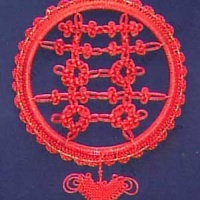 During the Qing Dynasty (1644 - 1911) knotting finally broke from its pure folklore status, becoming an acceptable art form in Chinese society and reached the pinnacle of its success. Knotting continued to flourish up until about the end of imperial China. The art of Chinese knotting was almost lost during the wars (1911 - 1950) and actually refreshed to thriving until 1980s. 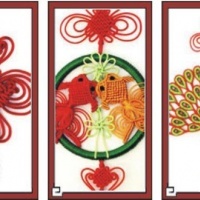 Do you know the traditional Chinese name for the decorative knots ?